kt literary » Blog Archive » Happy Launch Day to Natalie and Wen! Happy Launch Day to THE FAKE by Natalie Bahm and Wen Baragrey! We are pleased to share THE FAKE with our enthusiastic and voracious readers at Storybird.com. What is Storybird? Storybird is an online reading and writing platform where kids are encouraged to pair words and art, share their work, read and comment on other peoples’ work and experiment. Storybird has over four million users globally and is heavily targeted to the school market. This is the absolutely perfect platform for Natalie and Wen’s story and we are so pleased to be working with the Storybird team! THE FAKE is about Claire whose father is an ultra-famous painter asked to move to New York City to launch a high profile art show. 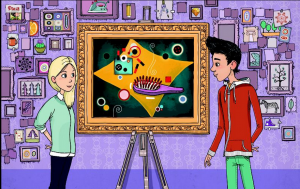 Claire is also an artist and the boy she meets at her new school might be an art thief. THE FAKE was illustrated by the world-renowned Bitskoff and will be serialized and released in chunks every Monday and Thursday for the next several months. Come enjoy Natalie, Wen and Bitskoff’s work – leave a “heart” or a comment – and share with your kids! Congratulations Natalie and Wen – I love this beautiful story and am so pleased others are loving it too! Read the first chapter of THE FAKE here. And check out more wonderful Storybird stories here. ← Happy Book Birthday to RED BUTTERFLY!